Our new video appointment experience has been streamlined to provide you with a more stable and reliable appointment experience! Over the last few months, you might have seen us testing the new interface and, perhaps, tested it out yourself! Now, it's time to generally release this new experience! If you've used any modern video chat software, you'll feel right at home with these changes! Gone are the days of having to navigate through Chrome's clunky settings! Using the integrated "settings" in the new app, you'll be able to change your devices on the fly. 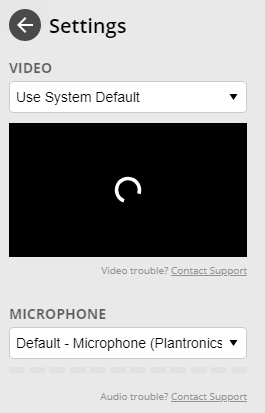 If your patients have their microphone muted, you'll be able to see this information in the status bar at the top. In addition to providing the same notification above but this time to patients, you will be notified when you are muted. In the event that there's a connectivity issue with your visit, you'll be able to see this in the status bar at the top. Should something happen, our software is better equipped to handle it. You'll receive informative messages in the event of an issue. We know you don't like to wait, and we don't either! We've introduced numerous under-the-hood enhancements to streamline the performance and quality of your visits. Some are subtle, but trust us: they all add up!